You could drink this within just a few weeks, which shouldn’t be too hard, it’s only very light alcohol and very refreshing on a warm day (if we get any). Shake the elderflowers well to remove any insects. Dissolve the sugar in 2 litres of boiling water, add 3 litres of cold water and allow to cool down to room temperature. Add the elderflowers and the lemon zest and juice, yeast nutrient and if you like a stronger champagne you can now add the yeast too. 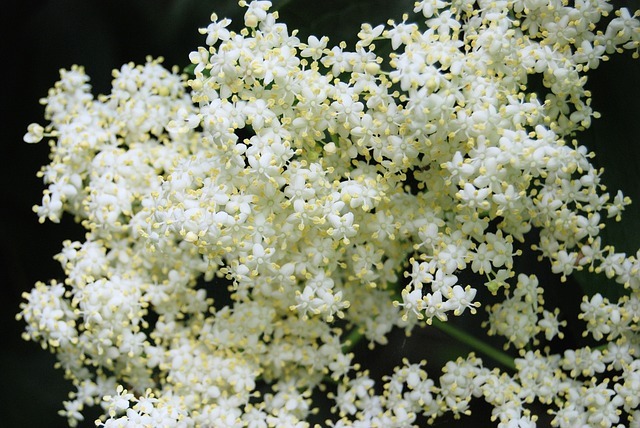 Elderflowers come with natural yeast, so it’s only optional to add more yeast. Leave to ferment for 6 days at room temperature. After fermentation strain through a muslin bag into strong, preferably champagne, bottles. Your elderflower champagne is ready to drink after about a week, but make sure you check the bottles regularly for any signs of too much pressure. I’ve had exploding elderflower bottles before (so did Stuart, in the bus! ).